Tufted Apple Budmoth (TABM): The second TABM flight is well underway. Adults started to emerge in northern counties on 5/16 and in southern counties on 5/1. Although this has been a minor pest, this might be changing. Trap counts in northern counties are historically high, and indicate higher than normal populations. Timings are outlined below for anyone who had high populations last year. San Jose Scale (SJS): Crawler emergence is well underway in southern counties. If you had known high populations of scale last year, it is important to note if crawlers are present, even if you treated with oil in the early spring. If crawlers are present then treatment options include Esteem, Movento, Centaur, and Diazinon. Esteem, Centaur and Movento should be applied at the beginning of crawler emergence. Diazinon is labeled for only one post bloom or foliar application on stone fruit (Rec = max. of 2 lb/acre of the 50W). The apple label allows up to 2 foliar applications per year as long as a prebloom application was not made. The peach label allows 1 foliar application per year. Foliar applications may cause russet on apples, but has worked in the field for scale crawlers as long as applications are made 1-2 weeks after the start of crawler emergence and again 2 weeks later. Brown Rot; Anthracnose: Thundershowers and overhead irrigation done around periods of warm temperatures and high humidity can provide good opportunities for brown rot infection, particularly in blocks with damaged fruit or blossom blight. An improved fungicide schedule should be initiated 2 to 3 weeks prior to the first picking. Pay attention to susceptible varieties such as white peaches. While cover sprays are important, the most important timings seem to be early preharvest sprays starting 4 weeks before harvest. Pristine has been very effective based on past experience. Merivon should be equally effective although data is lacking. Gem has not provided adequate control in the field. The QoI component of Luna Sensation has the same active ingredient as Gem, it is not known how effective Luna Sensation would be for anthracnose. Rusty Spot: Symptoms are appearing in the field now in southern counties. Maintain control measures until about pit hardening. This is another area where having flowering weeds in your ground cover is a bad thing. DMI fungicides (Rally; difenaconazole) are the current standard rusty spot controls, but if combined with a neonicotinoid insecticide insect control, you have a toxic combination for bees. If you have a weedy ground cover and use a neonic, then consider using one of the biorationals (Armicarb; Kaligreen; Serenade) in place of Rally to minimize impact on bees. Codling Moth (CM): The first codling moth flight continues in orchards with high populations. In recent years both the 1st and 2nd generations can be stretched out, and egg laying can occur over a longer period of time. This is reflected in prolonged high trap counts that are above the treatment threshold of 5 males per trap. Some recent counts this past week have been above 12-26 moths per trap. When this happens, additional insecticides may be needed, even supplemented by applications of Madex, a naturally occurring virus that is effective against codling moth and oriental fruit moth larvae. Dogwood Borer (DWB): Adults are now being captured statewide, indicating the start of adult emergence. Growers have traditionally applied a trunk spray of Lorsban at the start of adult emergence. This kills adults and newly hatching larvae. If you have DWB populations, particularly on young dwarfing trees, plan on a trunk spray treatment over the next week to 10 days. Alternatively, growers can also use mating disruption for control dogwood borer. Isomate® DWB can be applied at the rate of 100-200 dispensers per acre before adults emerge. For initial applications and high populations, 150 dispensers/A are suggested. DWB has become a significant pest in high density, dwarf apple plantings. Establishment costs in these orchards is high, making any loss of young trees a hardship. The Isomate product should be available from most AgChemical suppliers in NJ and can also be ordered from Great Lakes IPM in Michigan. The timing window is fast slipping away for mating disruption use except in far northern and northwestern areas. Summer Diseases and Apple Scab: Primary scab infection symptoms are visible on fruit and leaves in several sites in both northern and southern counties. Orchards with primary scab infections need to keep a tight schedule. If your orchard is scab free then the primary diseases of concern are the Rots, Sooty Blotch and Fly Speck. Anthracnose (Bitter Rot) has been troublesome in wet seasons especially on Empire and Honeycrisp. If you are using the extended EBDC schedule, control should be good on most cultivars. However, remember that when using the extended schedule the label limits applications to 21# per season, or 77 days prior to harvest. Where anthracnose control has been difficult consider using a program that rotates any of the following Pristine, Merivon, Captan, or Ziram in your summer program. Spotted Wing Drosophila is the key pest to control, so growers should choose materials primarily based on SWD control. Spotted wing drosophila adult male. 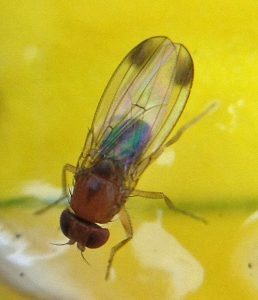 Spotted Wing Drosophila (SWD): SWD adult males are being captured in numerous locations. Numbers are low, but average about 3 times the level in Burlington County as being seen in Atlantic County. Maximum levels were 11 per trap in Burlington County. In most years ’Duke’ have largely escaped infestation, since they harvest early compared to the population build-up of SWD. DO NOT assume this is true for this year. Duke is very susceptible now, and ‘trapped’ populations appear to be on track for what they were last year by the 7-10 of July. In other words, the population pressure on Duke appears to be higher than in previous years. A 7 day program is needed now and through the remainder of the season. Choose a rotation of the following insecticides listed in Table 1. A blank under the Canada MRL column means there is no established MRL, so don’t use it if exporting to Canada. Table 1. Insecticides effective for Spotted Wing Drosophila with comparative MRLs for the US and Canada. Aphids: Aphid populations average about 2.5% infested shoots, with a maximum of 32% infested shoots. This average is slightly more than the previous week. Any time we see more than 10% of growing shoots infested with healthy colonies, we get concerned. Treatments are suggested when numbers exceed the 10% level. Cranberry Fruitworm (CBFW): Over trap counts have decreased, and targeted treatments are over. Some pockets are still present in Burlington County. Just about all insecticides that are effective for SWD, are also effective for CBFW. Captan and Canada: A number of growers have asked about the use of Captan and the various export markets, especially Canada. Please be aware that although the product is labeled in both the U.S. and Canada, there are different labels in Canada vs. the U.S. as well as different MRLs. Please see Table 2 for a summary of Captan MRLs for various export markets. Table 2. MRLs in ppm for Captan in US, Canadian and European markets.